Street paint and bike stencils have been applied and the first segment of the 13th Street bike lane is now open from South Street to Market. 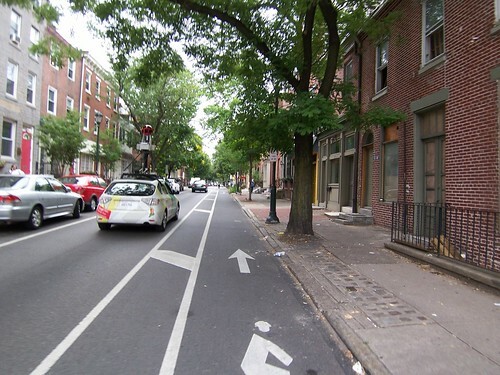 Over the next couple of weeks we can look forward to the bike lane being extended up to Spring Garden along with a companion bike lane on 10th Street. And talk about being at the the right place at the right time, we spotted the Google Street View camera car already documenting the City's newest bike lane at 13th and Pine. Rode this lane today. The stretch between Chestnut and Market was, as usual, an entire block full of unloading buses and tractor trailers. Hopefully this won't continue to be so much of an issue. The conflict seems intense in the picture of the bike lane ending at the beginning of a right-turn only lane. Drivers moving to the right to get into the right-turn lane won';t see the bicyclists trying to move left into the straight lane. What's the safest approach for a bicyclist to make that merge without getting right-hooked? Philly-style is to put in a mixing-zone at each intersection where cars could turn through the bike lane, to avoid the right hook you mention by way of a 10-yard merge. Our other buffered bike-lanes mostly lack the turn arrows in the mixing area, so for example if the bike lane is on the right, a car turning right through the bike lane on those lanes generally does so from the traffic lane on the left, making a hook more likely. These arrows make it clearer that the mixing should take place. The bikes need to know that the right-turn-only doesn't apply to them, which is entirely obvious, and a lesser evil than routinizing right turns from the left lane.